Michael J Mangano aka MJ is ModestoView, Gallo Center for the Arts and MJC resident photographer and graphic artists. He takes the pictures and creates the amazing covers every month for the Magazine. Most of the photographs you see posted by ModestoView be it on Facebook or Instagram are taken by Mangano. He is available for photo shoots but loves being more creative than your everyday portraits. My studio/office is where my camera takes me. What do you do? What is your Story? So here is a bit of my story on how I got here; I remember my dad took me to see a Sinbad movie at a young age and saw Harry Harryhausen animated monsters. I said to my parents I wanted a job that I could be creative every day, pretty much make monsters. I didn’t get into movies but for twenty years I worked in the Video Game Industry at places like Sega and 3do doing 3d modelling and animating dinosaur, monsters and baseball players. I had some of the most amazing moments in my life during that time, but after 20 years I couldn’t handle the long commutes and sleeping under my desk during deadlines. I was burnt out so It was time to move on and find a new creative job, so I picked up a camera and fell in love with the idea of catching a moment in time that tells a story. If it was a street or live music, photography allows me to capture that emotion in time. 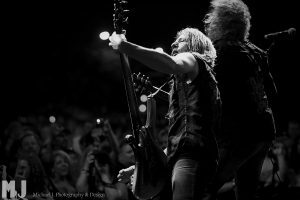 I remember when I was at Xfest 2011 as a photographer and was standing behind the band Y&T shooting their performance and captured a musical moment that made me smile(pic below). 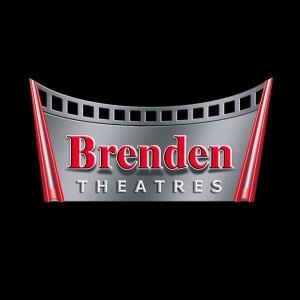 I knew I found my passion! I started to contribute to Modesto View magazine my Street/Live Music photographs. I loved the freedom of working for the magazine from one day shooting a Live concert to a comic con or some yummy restaurant dish, but I also knew my creative soul could not stay in one place. I guess I was still missing that creative part of me that created monster and fantasy worlds for games. 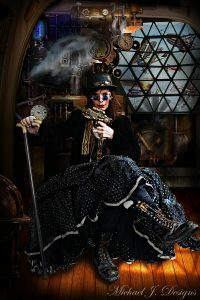 So one day I did a photo shoot with my best friend Jenn Allsup, who dressed up in a steampunk outfit. I combined my imagination and graphic skills with photography and a whole new world open up(pic below). 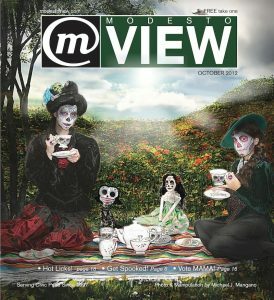 It was Chris Murphy the editor of Modesto View then asked me to create the October 2012 cover(pic below) and seven years later I have created some magical covers with him. I know the old saying jack of all trades and master of none may apply to me, but really don’t care if it does. I want to keep things fresh and always challenge myself, if it’s capturing a guitar player, football player catching air grabbing a pass, a child smiling seeing a storm-topper for the first or creating a creative portrait of a superhero. I have all the same goals with everything I create and that tells a story. I do not like to fit into any box or don’t think there is one big enough for me. Tell me about a project or accomplishment that you consider to be the most significant? Go ahead and brag. I’ve been asked what accomplishments that I consider being the most significant. A while back I created an artistic bucket list of goals I wanted to reach and art I wanted to create; from getting my Live Music photos into Rolling Stones magazine to writing a song. I may not get to them all but I’ve been blessed to have been able to cross some off my list like my photos hanging in Fuzio and Mistlin Gallery, having my work on a utility box downtown or my work in “Life and Times of Modesto”. I still have so some many things I want to accomplish and create, but my driving goal is when I am six feet under I want to be remembered through my work and story I am telling. As what are my plans for this year or my next projects. I know I will be working on our Star War May cover, but mainly I’ll just let my creative soul and inspiration lead me on my next artistic adventure. The Chris Murphy Question, Beatles or Rolling Stones? And sorry Chris Murphy I am a 70’s music guy so I will have to say ACDC and Queen.